With No U.S. Team In The World Cup, Let's Root For...Iceland? With no U.S. team in the upcoming World Cup competition, William Grant & Sons’ Reyka Vodka is urging Americans to root for a team near and dear to its heart in a new ad campaign: Team Iceland. As you probably guessed, the spirit is made there. 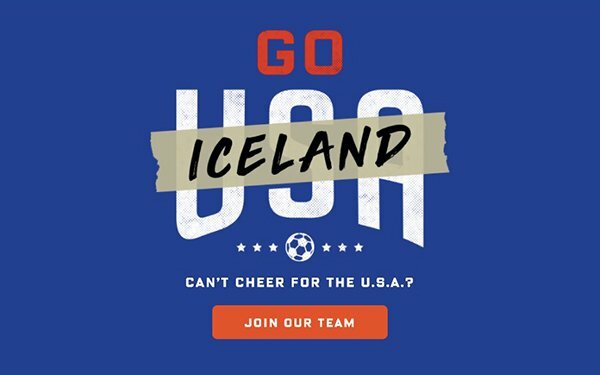 Developed with Red Tettemer O’Connell + Partners (RTO+P), the "Made of Iceland" campaign encourages Americans to root for the underdog Icelandic team with an online video that will run across Facebook and Instagram. TV ads will run in select in markets starting in late May, just a few weeks before the World Cup action begins in Mid-June in Russia. This campaign also marks the brand’s first ecommerce push with a website to sell fan gear to get people excited about Team Iceland, including T-shirts, scarves, drinkware and temporary tattoos. Leading up to the World Cup, Reyka Vodka brand teams will attend non-World Cup qualifying matches to form Team Iceland cheering sections, during which they will launch social-specific videos and content to support this initiative. Then, during the World Cup, Reyka will also launch digital videos that specifically address Team Iceland opponents, such as Nigeria, Argentina and Croatia. Last year, Reyka Vodka conducted a "takeover" of Portland, Oregon, which the brand felt most resembled its home country of Iceland. This Portland campaign included 15-second "Made of Iceland" commercials, featuring Reyka’s Superfan, Frikki, as well as concert sponsorships and point-of-sale promotions.